Are you looking for digital Valentine's themed activities that will keep your students engaged during the month of February? 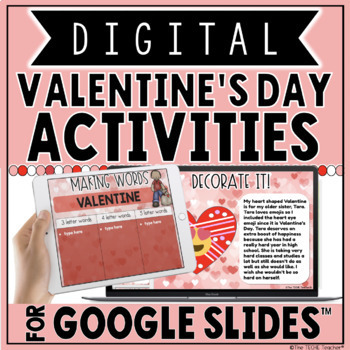 This resource contains 10 different digital Valentine's Day activities in Google Slides™ that are fun and paperless while remaining academic. Slide 3: Paragraph about Cupid: Students highlight the important information using the highlighter tool. Slide 4: Embedded YouTube video about the History of Valentine's Day (one version): After viewing the video, students type their answers in the right hand side of the table. After answers have been added the the table, students will use the magic reveal magnifying glass to uncover the correct answers that are hidden in the answer key that appears to the right of the slide. Slide 5: Fun Facts About Valentine's Day: Students will visit the three different kid friendly websites that are hyperlinked in the speaker notes to research facts about Valentine's Day. They will then type their 4 favorite facts using the text boxes provided on the hearts (graphic organizer). Slide 7: If I Were Cupid: Students will take a selfie and crop to a circular shape (directions included) to put as Cupid's face. They will then type a response in the provided text box about what life would be like if they were Cupid. 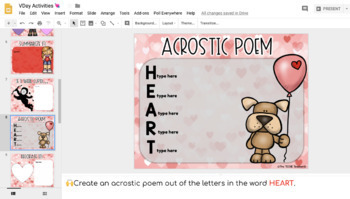 Slide 8: Acrostic Poem: Students will type an acrostic poem using the word HEART. Slide 9: Decorate It! 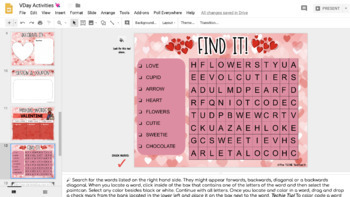 Students will decorate a heart shaped Valentine using the designing tools built into Google Slides for someone who needs an extra boost of happiness this Valentine's Day. They will then use the provided text box to type a response about who they decorated their heart for and why. 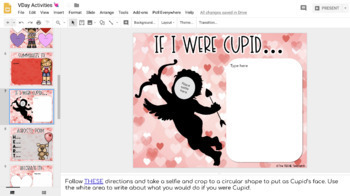 Slide 10: Design a Coupon: Students will use the tools built into Google Slides to design a coupon for a loved one that they could print or email them for Valentine’s Day. (Ex: wash the dishes for a week, a back rub, pick a movie, breakfast in bed, etc.). Slide 11: Making Words: Students will type 3 letter, 4 letter and 5+ letter words they can make from the letters in VALENTINE. Slide 12: Find It! Word Search: Students can use the fill tool or line tool to mark words they find. Draggable check marks are provided for students to mark off the words they have found. All slides contain student directions in the speaker notes. This resource comes as a link in a PDF file. First, make sure you are signed into your Google account. Click on the link and you will be prompted to "Make a Copy". Rename the file to whatever you would like. The presentation will be sent directly to your Drive! Disperse to your students via Google Classroom™, Google Drive™ Shared folder, your Learning Platform, etc..
© 2015 Google and the Google Apps are registered trademarks of Google Inc.